I approached it a little different this time--I am looking on a per pack basis so that it is more applicable to sealed as well as draft. This shouldn't alter the results that much, and it should be roughly equivalent to the previous methods. Perhaps if I find the time I will adjust all previous sets to use the same information. The extra rares mean that there is a slightly less chance of getting a mythic--instead of the typical 15/121 chance of a mythic, the odds will be close to 13/109, which is about a 0.4% drop. It's possible this number is slightly off, but with such small percentages, it will not drastically affect the analysis. By doing is as a per-pack basis, this allows normalization. The above sum to 1 - i.e. a random card from a random pack will be a common ~71% of the time. This allows for easier looks at the numbers. This also stops some of the over representation of Mythics and Rares under the previous model - which is more useful to reality as common and uncommons are far more impactful in most games. Rivals of Ixalan also presents the small set syndrome - the draft and sealed environments are not 100% Rivals of Ixalan. Luckily (at least for analysis ease) this is the last time. This means it will be better to compare Rivals to previous second sets in a block, and I will include some analysis based on the weighted average across a pool (doesn't matter if it is draft or sealed as the ratio of 2 RIX to 1 XLN is the same in both). The numbers above are rounded, but I did not round in the calculation steps, only the final numbers. Jadelight Ranger - Similar to Ixalan, I am simply assuming +1/+1 counter 60% of the time, as an approximation of the lands in deck when you explore. Tomb Robber - This is one I was unsure about. There are several scenarios that make sense, but under any of them it seemed like the average would probably be around 2 +1/+1 counters. You might discard lands to hit lands. You likely won't discard most cards in your deck simply for a chance at a +1/+1 counter. So, I have him at 2.2/2.2 P/T (1+0.6*2). Sanguine Glorifier - I assume you have a vampire about half the time, so this adds 3.5/3.5 P/T to the board. As usual, I must credit oraymw for the data he made available to the public following his Kaladesh entry. While anyone could cultivate it, it is extremely useful to have it readily available, and very kind of him to leave it open to the public. The trend continues down, however Rivals is a bit different since it is a second set--they tend to have lower CMC than their base. It's also not as concerning when you consider that 6 years, the drop has been about 1/2 a mana. It's also noteworthy that the exact starting point is relatively arbitrary--no matter what method I chose a starting point by, there are going to be reasons for and against it. In the end, I am keeping with my choice of Return to Ravnica for two reasons: it made the information easy enough to digest in a graph, and Return to Ravnica is considered the latest surge in player base and when Wizards began printing considerably larger quantities of cards. I might drop RTR block starting with Dominaria, keeping a once a year drop from this list. Something new this time around: I am going to add the average CMC of only the commons, as those as the center point of the limited game. 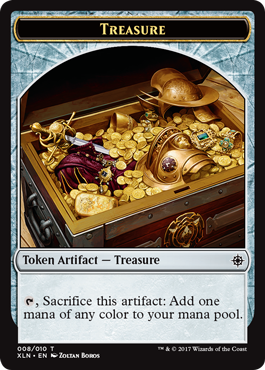 The most interesting thing that stands out to me here is actually Ixalan - most of the other sets have a decent drop off, but Ixalan does not. This shouldn't be too surprising either, as more complex cards are at higher rarities and generally have to cost more. Ixalan may have broken with trend because of the dinosaurs taking up a decent chunk of space and being bigger in general. But, Rivals doesn't have that same thing going? In a sense. 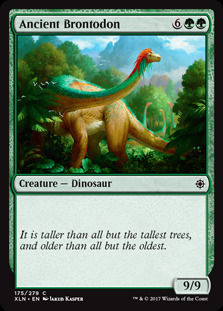 There were 14 dinosaur commons in Ixalan out of 58 creatures, and in Rivals it is 10 in 44, a slight decline. Part of it might also simply be attributable to Ancient Brontodon , a relatively rare common 8 drop. This also shows that Rivals doesn't quite match the cheapest set in recent memory, Eldritch Moon, when you bear down to commons. Rivals common CMC is fairly close to Amonkhet, so there might be similarities there. Particularly, Rivals has some incredible two drops--Legion Lieutenant and Merfolk Mistbinder are uncommon two-drop lords, while cards like Hardy Veteran make blocking far more difficult than normal for a two drop. These combine into the potential for a fast format. However, I think synergy will play a bigger role than simply slamming a bunch of two drops. I might try to measure synergy starting with Dominaria--since Rivals is a second set, it would be very difficult to model with any accuracy in the short window I produce these articles. 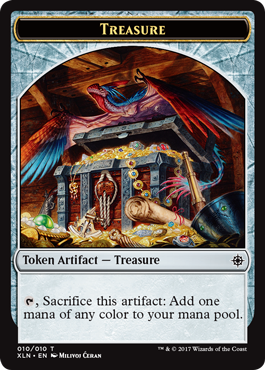 Very similar to Ixalan, we have a number of treasure making cards and some ramp, but not much in the way of mana sinks--the only common mana sink is Sun-Collared Raptor . Of course, this won't matter if you can make a strong synergistic deck that overruns your opponent, but it is a problem for games that go long. I played a number of sealed matches where the player using treasures drew the wrong half of the deck at the wrong time - maybe sitting with 7 lands and 6 treasures before getting the first big pay off for instance. In draft this is less of an issue, but I expect it to rear it's head in sealed again. Another note is that some creatures from Ixalan are reprinted--Legion Conquistador and Colossal Dreadmaw , for instance. So, decks that favored those cards might not even change all that much from Ixalan. All told, I think the above information about Rivals points to a continuation of the same format, not a radical departure. Rivals seems unlikely to be Hour of Devastation and completely rework the format overnight. Especially with the tribal focus, it seems entirely viable to simply go into Rivals with your preferred strategies from Ixalan and start from there, assuming roughly the same will work. I still was unable to get Aether Revolt and Hour of Devastation in, as life has been crazy since starting my career and expecting another child. So, I may eventually try and get those two added simply for completeness, but I am unsure if that will happen, or when. What I find interesting is that the drop in total Power and Toughness for Rivals comes almost completely from Toughness. The weighted power of the two sets by CMC is nearly identical (enough so that they round to the same number). So, Rivals should have less games with big stalls than Ixalan, and the ability to build a grindier, turtle style draft deck will also be hampered. There doesn't even really seem to be a good comparison going from one set to another within a block. In the end, I would expect more fast strategies and go wide strategies--or at the least, no fewer than currently exist in the format. When placed here we see that Rivals is among the cheapest, but also lowest power sets. In fact, it is very close to Born of the Gods, a set that is generally not that fondly remembered. At least Rivals has the strong synergy to fall back on, whereas Theros block was an enchantment theme and was resting more on its lore. You can also see that Ixalan was very close to Theros in this chart, meaning that the Born-Born-Theros draft and sealed environment might be the most comparable in terms of how much creature you get for your mana. At least there is not the battle-cruiser aspect of Theros block present here--though that may actually be bad when you consider the power level. It's also interesting to note that Wizards has been keeping the overall balance relatively stable, as the trend line doesn't show much long term change. Wizards, seemingly, is trying to offer many types of limited formats, as some of the wild swings indicate. Through that, they are still keeping a fairly even balance. Each creature gets a point value as listed above, and a 0 if it has nothing. As I mentioned last time, Amonkhet's number is likely inaccurate and I have not have the time (or remembrance) to go back and fix it. Hopefully I can get that fixed at some point. Onto Rivals. As all of the above stated, Rivals doesn't deviate too much from Ixalan in that the evasive equality is around the same, with the notable lack of direct reliably repeatable damage. With the Merfolk coming out stronger in Rivals, there are several more unblockable creatures, and Aquatic Incursion gives a very viable way to close out games if they stall. There is one very notable evasive creature, Soul of the Rapids . It basically requires a creature capable of blocking a flier (there is only one reach creature in the set - Zacama, Primal Calamity ). That flier is also a common, even if it is a 5 drop, so I expect it to close out a lot of games. So, this is my list of card advantage cards. These are the ones that will nearly always provide advantage. There is not much out of the ordinary, especially at common. 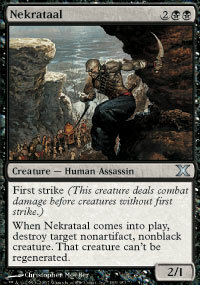 The most thrilling card here might by Ravenous Chupacabra - the new Nekrataal . While it is a fair bit worse as a creature, it can kill anything which is good. It's also worth noting that there are several token producers I am not including. A 1/1 token, generally, is not worth a card, whereas 2 or 3 generally are worth a card. So, I don't think of Aquatic Incursion as card advantage normally. Often a single token is simply a life gain spell as chump blockers, which is not something you would normally play. Rivals does have one non-traditional card advantage-esque card that I thought about including above: Strength of the Pack . 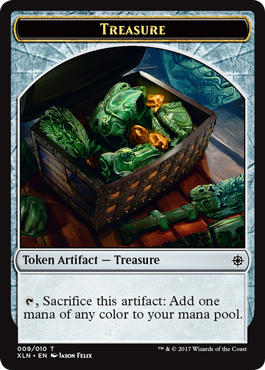 In some decks, this will carry far more than a single card worth of value. But some games, it will be a dead card. I trust in the right deck, it will be a significant beating. Again, Rivals is about the same space as Ixalan, with about a quarter of the cards being removal in some sense. This means your typical back will have 3 or 4 removal in it, with 2-3 being common, 2/3 of the time an uncommon removal, and occasionally rare or mythic removal. Again, this is a pretty board definition of removal - it includes bounce, counter, selective discard. First, a note: I changed computers and have had some issue reconciling my files. So, this article has taken far longer than I anticipated, so the Rivals CMC is unweighted. It shouldn't be too drastic a difference, but I wanted to be upfront. Again, we see the same trend - Rivals does not depart from Ixalan. After this is published, I will comment with a link to Google Docs where I will upload the raw data for people to look at or use. I will upload my master list - nearly every card on MTGO, with color, rarity, card type and some other info. As always, I appreciate thoughts, comments, and suggestions. Hopefully I incorporated some of the previous comments well, and would like suggestions on going forward. Good luck at the prerelease and see you online! I think I will have to read this once again later (after I play more with RIX than I have so far). RIX seems to be hyper aggressive to me. Or at least my decks usually were pretty fast. It's faster than XLN alone and Dinosaurs are also kind of accelerated. The whole Standard will be like that actually. Soul of the Rapids is a really bad creature and something you really do not want to play (yeah, ok I've seen someone have that enchanted with Mark of the Vampire, but seriously this card is bad). If your deck runs flyers you are on offensive and usually play them on 2 mana slot, 3 mana slot and then the game is pretty much over (ok. usually on turn 8 as it seems). You certainly won't care if someone plays Soul of the Rapids on turn 5 or later since you will just go through. It may be difficult to block, but you really do not care about blocking that unless things are really bad and then it doesn't matter what your opponent would have played.